Is It Possible To Find A Cheap Bridesmaid Dress that doesn't look awful? A cheap bridesmaid dress can still look stunning, you just need to know where to look and spend your money. Lots of wedding boutiques, especially the online ones are offering some great deals on bridesmaid dresses. They all have a big choice of colors so there is bound to be something that will match your color scheme. Here are also some lovely ones, available in more than the colors shown, that are all under $100, to show you what you could buy within your budget. 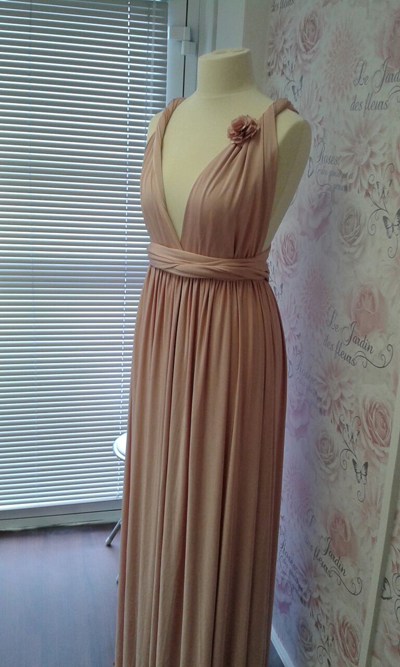 Also have a look at cheap secondhand bridesmaid dresses. One of my brides managed to find perfect dresses for her bridesmaids and maid of honor at a local thrift store. Her top tip was to talk to the ladies working in all of the thrift stores in her town and telling them what she was looking for, she left her name and number and after a few weeks she got a couple of calls to tell her what bridesmaid dresses were in. It is unlikely that all your bridesmaids will be the same shape and although they will not say that they don't like your choice of dress they may look better in something that suits their shape. To avoid this you could let them choose their own dress, just let them know what color and the type of style - traditional or modern. You could then match up the bridesmaid dresses by adding the same shoes, shawl or scarf. Department stores are a great place to look, they have a great variety of ball or prom dresses that would be perfect. Just make sure you avoid prom season as you could end up paying over the odds. Sale time is a great place to pick up a discount bridesmaid dress. Multi-way or transformer dresses as in the photo are also a fab choice, because they come in one size, are made from lovely stretchy material and they can be worn many ways. That way each of your bridesmaids can find a way that they like to wear it. If you are buying your dresses from a wedding shop ask for a group discount and keep your eye out for the sales. A unique look would be to have a vintage or antique dress, you could have all of your bridesmaids dressed in the same era dresses, this obviously is best for a vintage wedding where this style will suit. 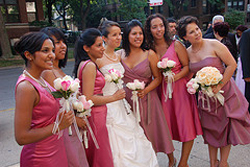 Renting your bridesmaid dresses is a cheap option, make sure they are from the same outlet so the fabric will match. That also goes for buying the same dress from the same outlet as fabric can differ. Flower girls dresses always look so sweet! A cheap bridesmaid dress for them could be found in a department store or you could ask if they have a party or fairy dress that would look perfect. Save money on shoes for bridesmaids by asking them to wear their own. Ballet shoes look great too! Secondhand dresses for your bridesmaids is a real money saver, especially if you are lucky enough to find dresses to fit each of your girls! Not everyone can be that lucky but it is worth looking. Be careful if you buy the dresses from different sources as the dress may be the same make and model number but end up being a different shade. If you do end up buying your dresses seperately you might want to go with complimentary colors rather than an exact match, that way they will look as if they are meant to be together! If you have lots of bridesmaids then you could have the girls pair up and have each pair in a color that suits them and also works for your overall look. As with all secondhand wedding dress buying make sure you have a good dressmaker ready to do any alterations, don't go with the ones from a wedding boutique as their services will be charged out at an astronomical amount!